Puzzle Quest 2 mixes pretty colours and RPG-style character progression, and lets you match gems and snag delicious loot. A robed sorceress meets eyes with an Orc warlord. The mage raises her enchanted staff to meet him, and the mighty titans clash at the height of their fame and glory, turning their weapons forward...to quietly sit down and match gems. Puzzle Quest 2 is more than medieval tic-tac-toe. Infinite Interactive has not only refined the original's gameplay (one of gaming's most addictive drugs), they've created an elaborate scheme to lure you into becoming a pure slave to color matching, temping you with constant rewards. 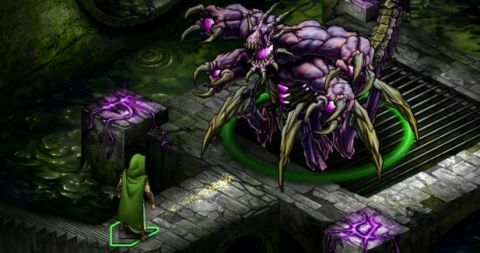 The shift to a dungeon-crawler presentation, however, wonderfully eases the repetition of gem-matching. You guide your character from an isometric perspective, moving within a many-roomed, many-leveled frozen castle, wading through tons of attractive, original art (as opposed to the gaudy, repetitive map you might expect) between games, creating an intrinsic reward for exploring. On the game board, PQ2 stuffs steady complexity and strategy into the turn-based template: a range of spells—both yours and your enemies'—make you think purposefully about your moves. By the second chapter, you're manipulating the board beyond recognition—twisting tiles, replacing rows and setting up double-multipliers to deal damage to your opponent. I'm almost embarrassed by the sense of drama I felt from such an outwardly modest game. At times I'd hold my breath, hoping the AI wouldn't match a crucial four-in-a-row that'd net it an extra turn. Minibosses, such as a yeti that I faced early on, mix up the rules so that I was always revising my strategy. Blue matches healed him, red ones damaged him. Suddenly my go-to spell that redirects damage to my blue mana pool was worthless—I had to improvise and come up with a new strategy that relied heavily on my red mana pool to defeat him. There's also multiplayer: four competitive modes, and friends or anonymous jewel rearrangers can even play as enemies in your campaign, in case you tire of the AI's tricks. If there's a tedious downside to PQ2, it's that its minigames aren't escapes from the “match three” mechanic of the main gameplay. Locked doors, treasure chests, magical seals and hidden traps encountered along your journey are all dealt with by matching more mixed-up icons. But that's what we're here for, right? PQ2 is brain-tickling puzzling in a fantasy wrapper. It runs perfectly in a window while you're doing something else on your PC; attend to it in free moments to rack up loot, levels, new spells and satisfaction.